Here’s something a bit different. 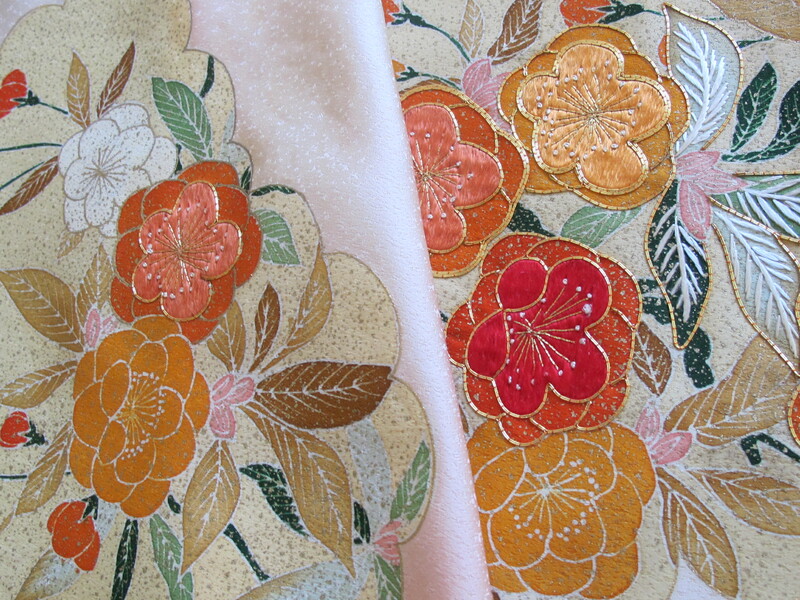 Are there any lovers of vintage Japanese kimono silks out there? One day I will show you the silk kimonos that I have collected, and ultimately need to rehome. In the meantime, here is a glorious roll of vintage Japanese kimono silk. Out of rolls just like this one, those magnificent kimonos are constructed. There are sites around that tell you a lot more about these silk rolls. I looked them up a few months ago when I pulled out this roll. If you are interested in this roll, please do go and have a look at some of the sites. I haven’t unravelled this roll because I don’t have the space to lay out 12 – 15 metres of the fabric, which is the length range that this one will be in, and I didn’t want to mess up the neat roll too. This silk has the palest pink embossed silk base with repeating motifs featuring traditional Japanese flower motifs. These are interspersed right throughout the roll like this. 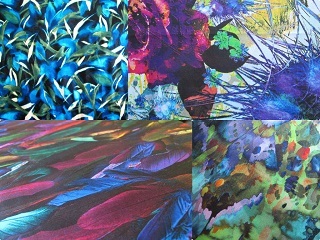 It is a typical layout for Japanese kimono designs. 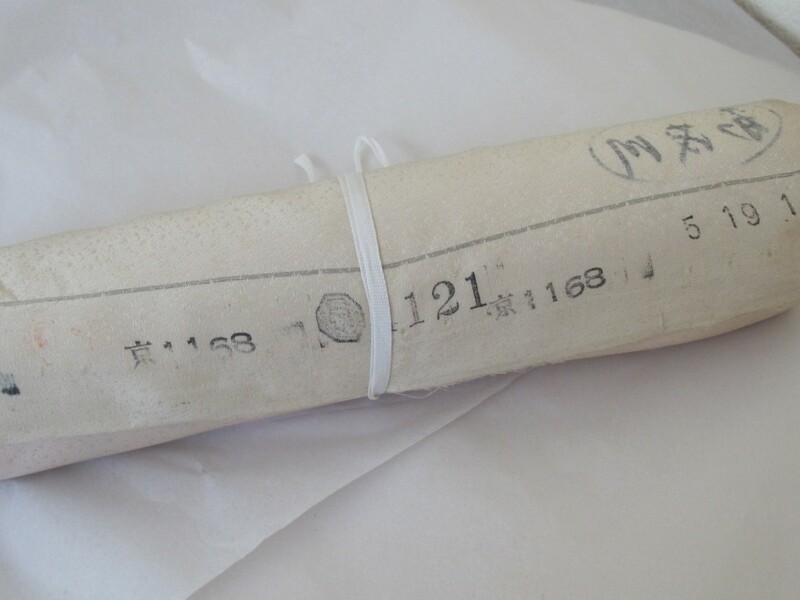 The really beauty of this particular roll is the incredible hand embroidery. 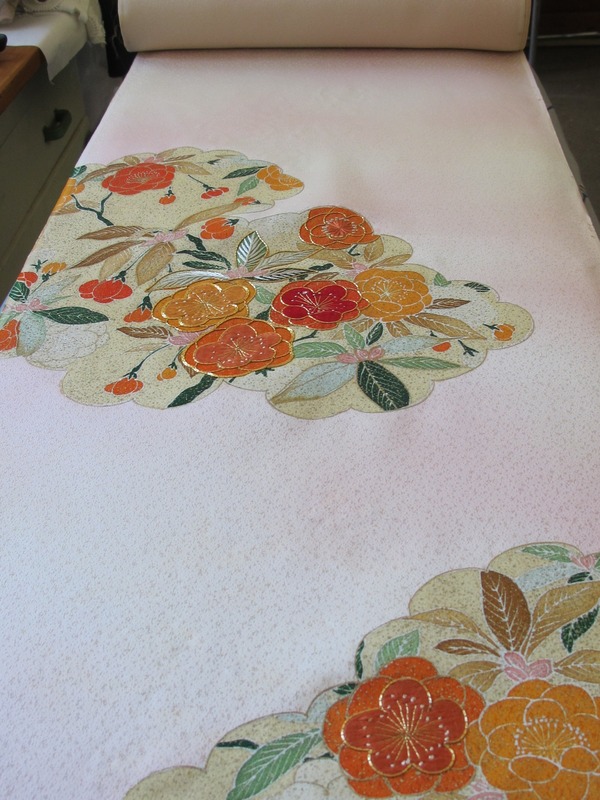 Japanese embroidery is an art form. It takes years and years of study under master embroiderers to become accomplished and it is a highly honoured skill in Japan. If you are remotely interested, do read up on it. 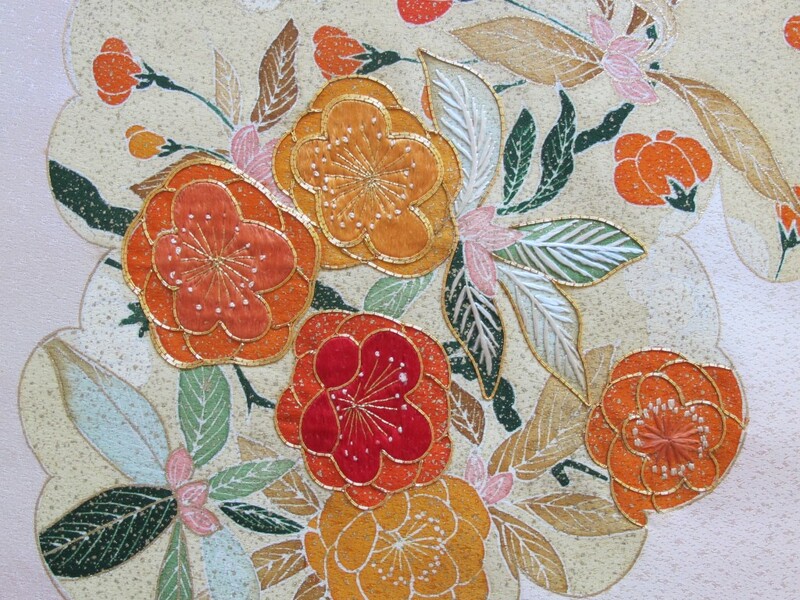 A distinguishing feature of Japanese embroidery is the very flat and even nature of stitches, evident in this piece. 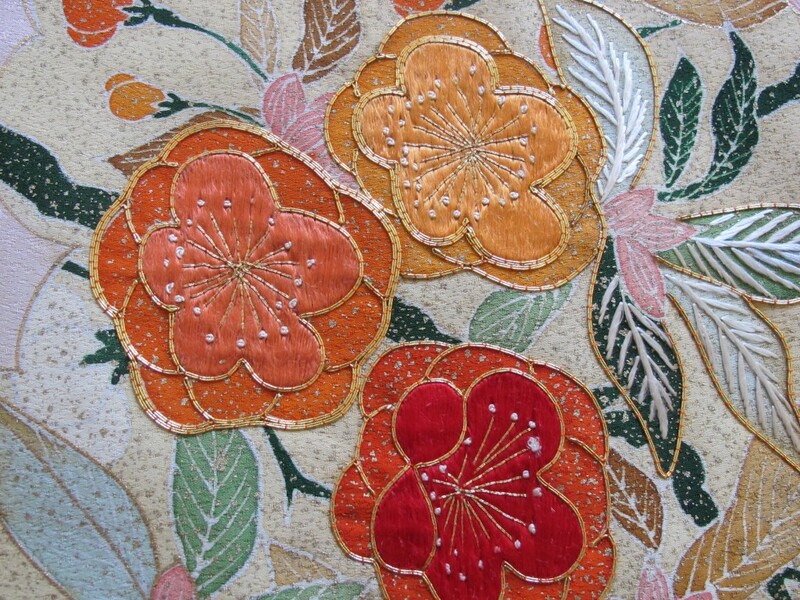 You can also see the really accomplished gold thread couching outlining the embroidered flowers. 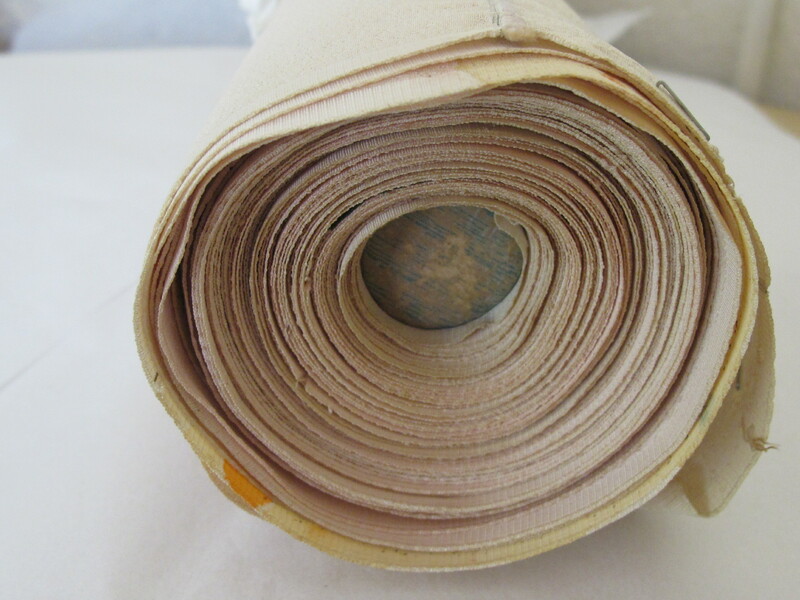 People buy these roll to use for clothes, or just feature elements of them for pockets, yokes, collars and cuffs; to make accessories, work up gift ideas like jewellery rolls/envelopes, table runners, patchwork quilts…on and on with wonderful and creative re-workings of the silk. When I did some research on these rolls before, I saw that the plain silk rolls were selling in the market for anywhere between $60 – $90 US. The embroidery in this silk elevates the roll entirely and I didn’t see any like it on my search so I think it would be expensive, but I am going to offer it for $55 here. As I said earlier, the specialist sites specify that these rolls usually have been 12 – 15 metres of the fabric, and it is narrow to conform with the way that kimonos are constructed, but I can’t give you more specifications than that at the moment. Because of the dimensions, I think I would need to post this in a medium satchel for $13.40. Please see here for full details on payment and posting. If interested, please click on the email link below; fabric details will appear automatically and I will get back to you asap. (Australia delivery only thanks).